Since 2014, the local food scene had been blessed with the signature dishes from international chef celebrity Todd English, thanks to the Foodee Global Concepts which made a series of T.E. 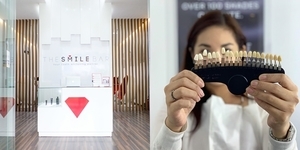 specialized restaurants in Manila possible. 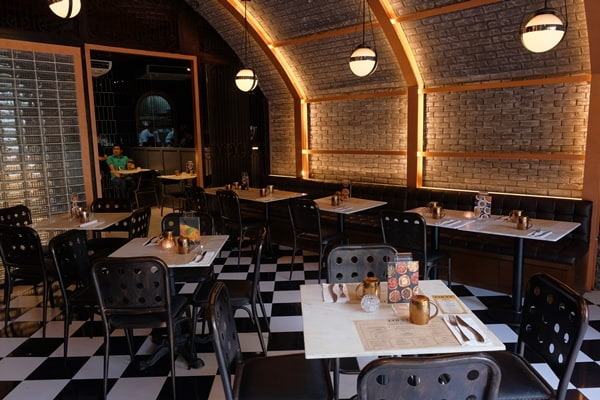 Just after the successful relaunch of The Food Hall which houses samplers from the chef's different specialty cuisines, a new spot has risen at the heart of Greenbelt 3 in Makati, putting together the diner-esque meals of burgers and flatbread pizzas in one restaurant. Pound X Flatterie is the resto crossover that is neither too extravagant nor too measly for people who are in for a nice and satisfying T.E. meal any time of the day. 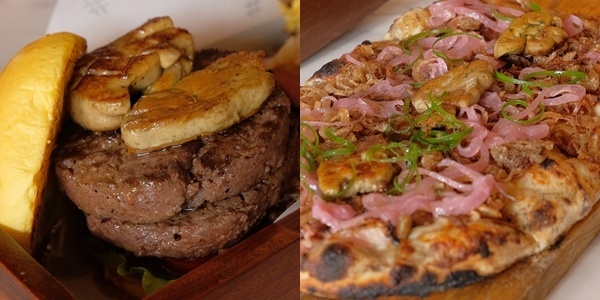 It ties together the American staples burger and pizza, and presents them in all posh and luxury, the Todd English way. Upon entering the place, you will be welcomed by a cozy and elegant space with an arched ceiling that hung spherical dim lights. With a 53 seating capacity, Pound X Flatterie further accentuates an upscale 1920’s speakeasy dining experience with its marble tables, white brick walls, and metal frames, all of which do not stray far from the common ambiance of the other T.E. restaurants in the country. 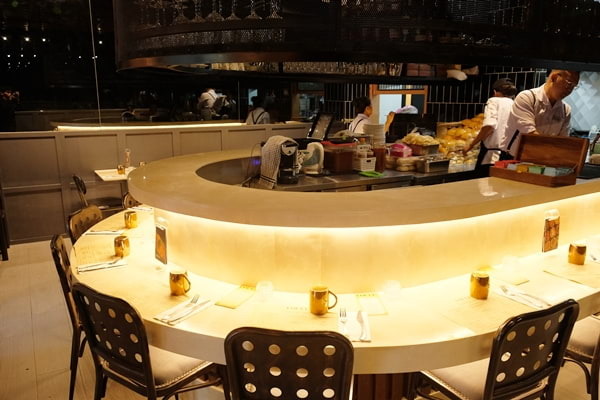 Behind a dividing wall with two entranceways are more seats, a round bar counter, and huge window grills that give customers a peek of what’s happening inside the kitchen. Since you’re dining on a two-in-one resto, you get to choose from both the menus of Pound and Flatterie. If you’re in the mood, you could also pair your order with the available alcoholic drinks of your fancy. To give you a better grasp of this merging between the two food places, here is a roundup of the must-try dishes recommended by Pound X Flatterie’s very own Executive Chef Carlo Miguel. 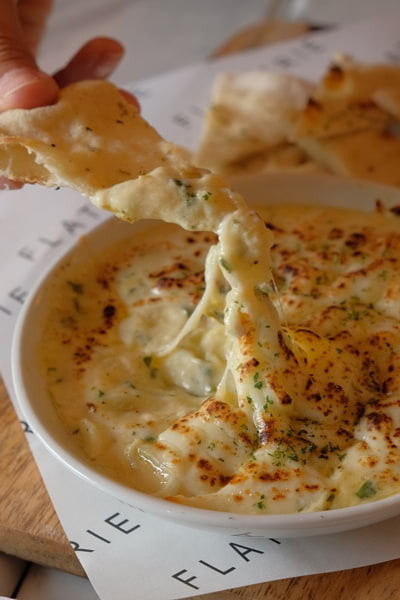 For appetizers, start with Flatterie’s Spinach and Artichoke Dip (P260) which combines the rich and creamy flavor of mozzarella with the mildly sweet and nutty flavors of spinach and artichoke, all fused into one tasty dip perfect for small crostini slices. 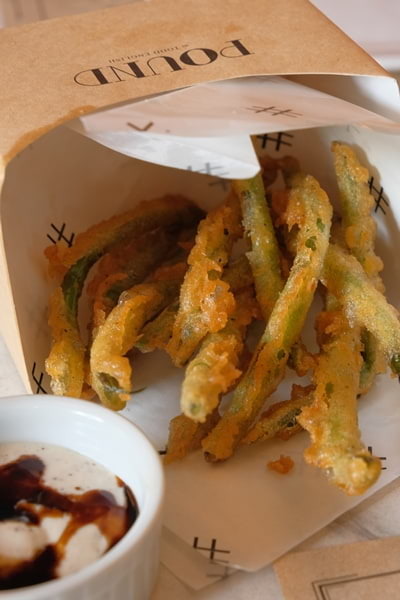 You can also begin your meal with the crisp Pound appetizer, the Truffle French Beans (P100). The fact that it is made with the so-called “diamonds of gastronomy,” it’s no surprise that this is one scrumptious starter. 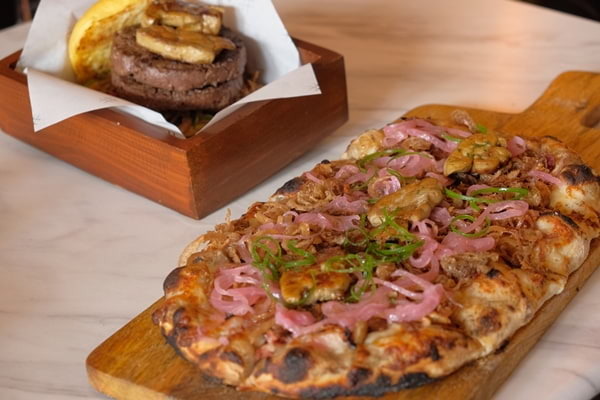 The flatbread and burger dishes are the highlights of your meal at Pound X Flatterie, thus you must choose wisely, but given the already sophisticated options available, every choice seems wise even for the critical connoisseurs. 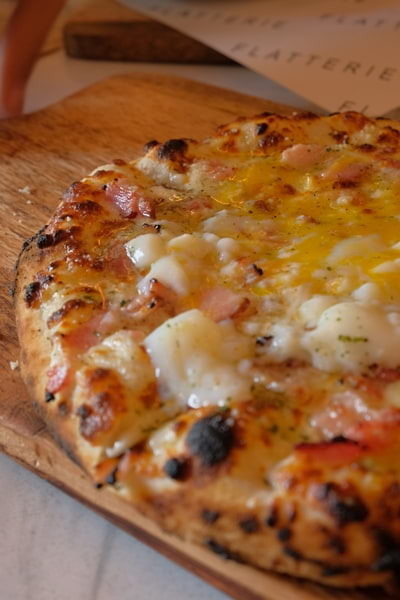 Have a slice of their creamy Carbonara (P200-P300) flatbread. Its saltiness from the bacon and Parmesan cheese is carefully balanced by the flavors of egg and cream, giving it a mild milky taste. On the other hand, literally, if you plan to munch on two different pizzas at once, is the Spicy Garlic Shrimp (P250-P350) flatbread crafted to assault your taste buds with a hint of spice over an umami slice. 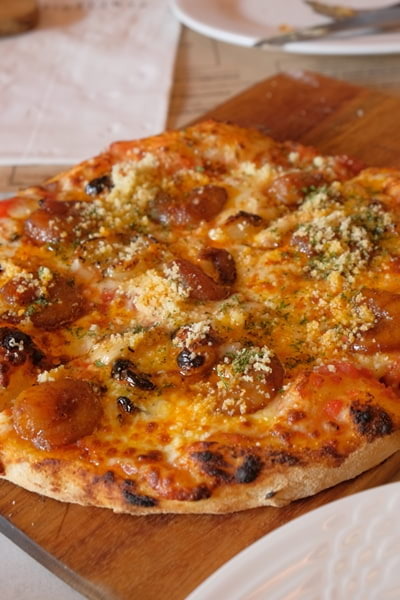 If you prefer the meatiness emphasized, the Sausage & Pesto (P190-290) flatbread is the one for you. 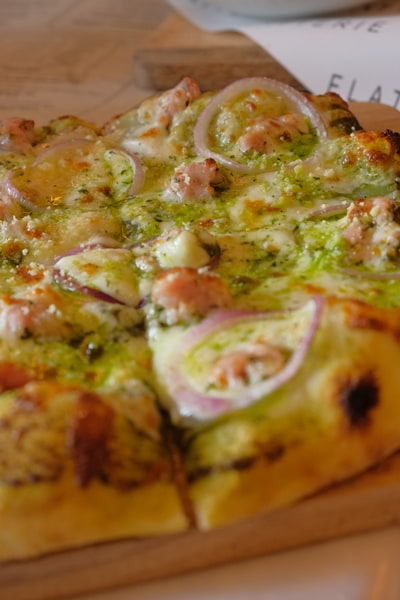 Infused with Italian sausage, pesto, red onion, and potato, it may have a deceiving look with its subtle green appearance, but a single bite is sure to win the carnivore in you! 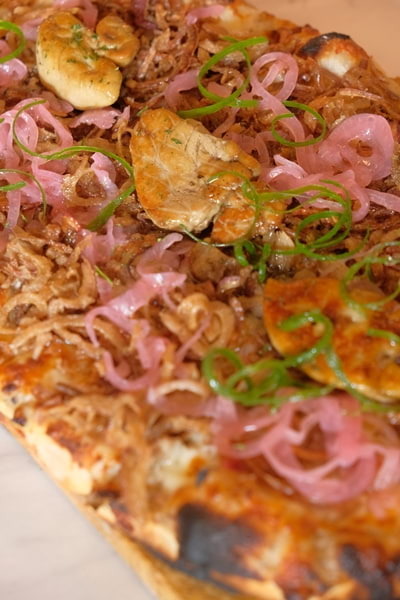 Indulgence (P890) is such a lavish name for a dish, but it couldn’t be any more fitting with Flatterie’s most costly (and for good reason) flatbread pizza. 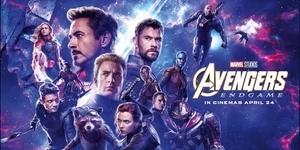 Imagine truffle oil and huge chunks of foie gras on top of a Parmesan flatbread with caramelized onions and grilled steak. Yes, it sure does define indulgence! 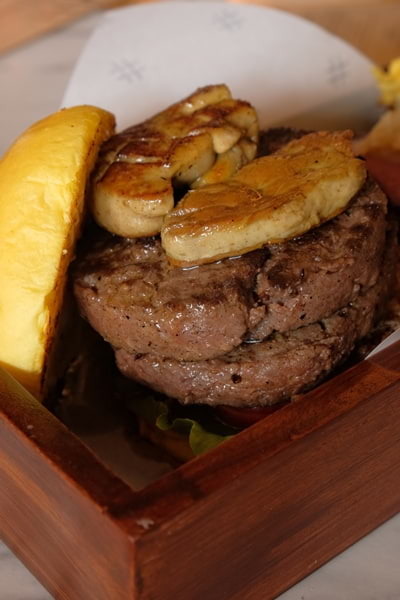 If it’s all about the indulgence, Pound’s Foie Gras Burger (P700) is yet another luxurious must-try. Between the buns are two thick house ground beef patties, iceberg lettuce, tomato slices, crispy onions, caramelized onions, mustard relish and their signature T.E. sauce; but what makes it the most special burger of the place is the 50g seared foie gras smacked on top of the patties. 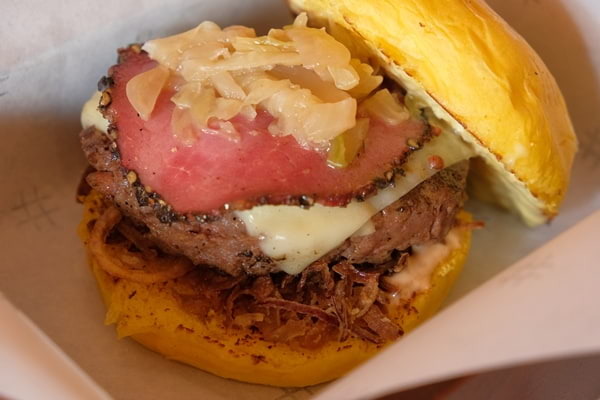 If you prefer a simpler take on burgers without sacrificing the Todd English touch, you’ll enjoy the Amsterdam Burger (P280), made more special with pastrami strips, gruyere cheese, and sauerkraut on top of a savory and juicy ground beef patty. 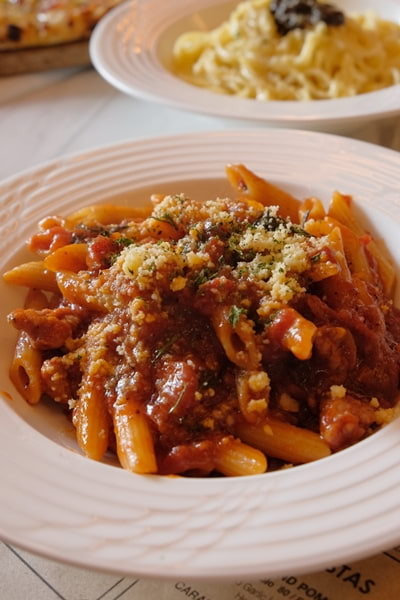 Since Flatterie is meant to serve customers an Italian gastronomic experience, you can also find here different pasta selections. 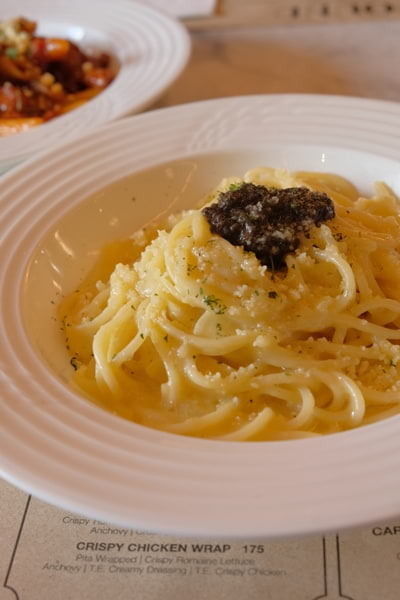 The Truffle Pasta (P220/selfie; P320/groupie) is another truffle-infused dish perfect for those who want their pasta extra creamy over al dente spaghetti noodles, while the Sausage Penne (P260/selfie; P320/groupie) are for those inclined to have their pasta dish dominated by tomato, cheese, and meat. If you seek rice meals, you’re not in the wrong place either. The Beef Pot Roast (P450) is a certain delight to the usual Filipino taste buds. 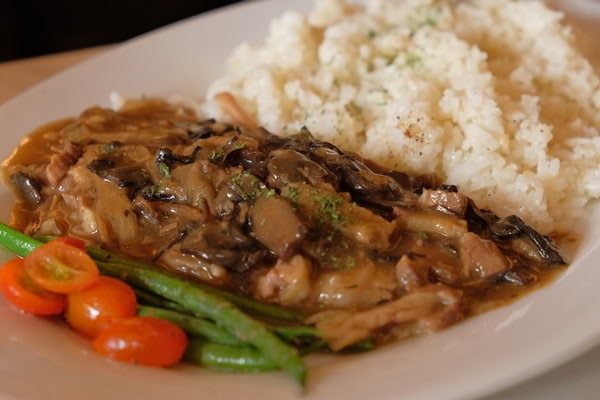 Sweet and savory mushroom gravy is drizzled over tender Angus roast beef and served with tasty rice pilaf. Their generous servings of burgers, flatbreads, and rice meals might already seem too much for your main course, but if you want a complete Pound X Flatterie experience, remember to save a lot of room for dessert. 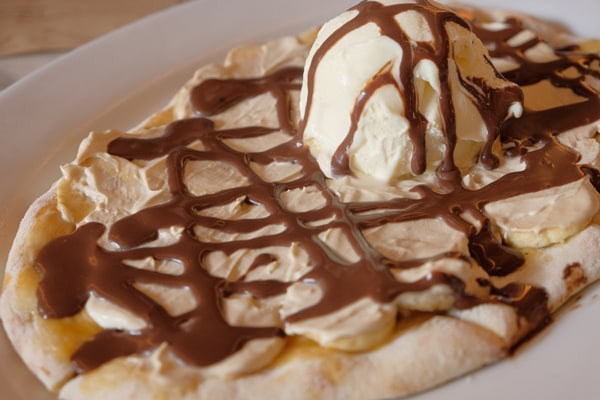 Flatterie’s underdog dessert is the Banoffee Flatbread (P240) which is rarely the top priority of first-time diners especially that it contends with the S’mores Flatbread (P270) on the menu. However, this nummy treat can quickly become everyone’s favorite as the delectable dulce de leche and chocolate sauce begets a sweet affair with the coffee-infused whipped cream, over the slightly salty taste of the flatbread, and fruity banana mix-ins. 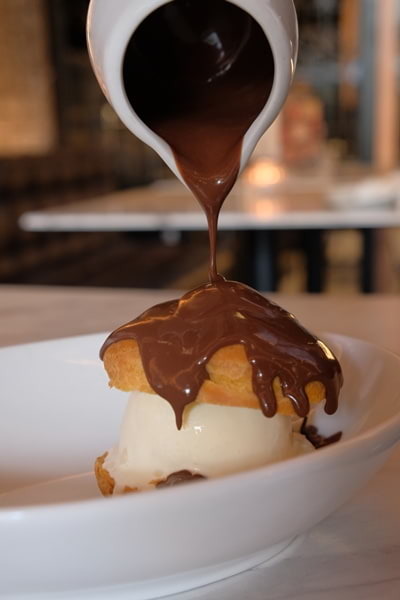 The Ice Cream Puff (P220) is an aesthetic confection with a vanilla ice cream sandwiched between a freshly baked profiterole. It is served with a pitcher of chocolate sauce that you can pour beautifully over the dessert. In addition, Pound’s Cookie a la Mode isn’t far behind on the dessert lineup. 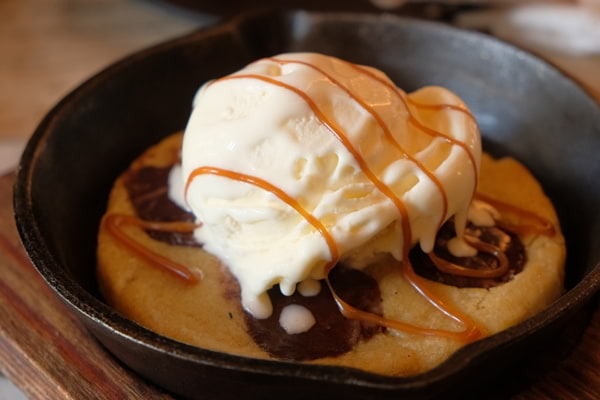 A still-warm chocolate chip cookie on a pan is crowned with a scoop of dulce de leche ice cream. If you're seeking fixed and affordable meals, you can also try their Classic Deals. For a price of P179, you can enjoy a glass of Foodee Iced Tea, a T.E. Slider, and either a Caramelized Bacon Alfredo or Pound Pomodoro. With your P249, you can also score their Good Ol' Fries, Foodee Iced Tea, and your choice between the Backyard Cheeseburger and the Secret Menu Burger. Pound X Flatterie is definitely the next go-to spot for Todd English foodies, and an ideal choice for those who are planning to try the chef’s signature dishes, because no matter the hunger and cravings you have when you enter, you are sure to leave with twice the satisfaction. 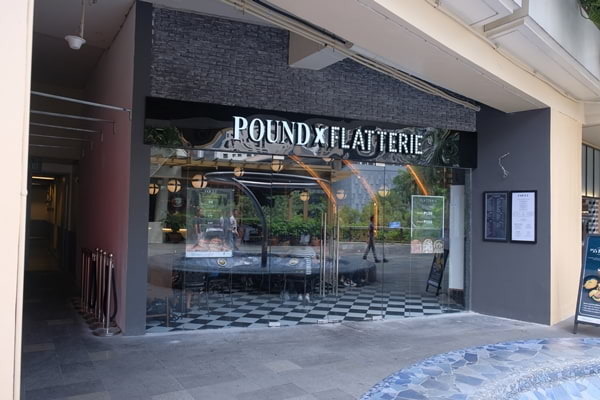 Pound X Flatterie is located at the Level 2 of Greenbelt 3, Ayala Center, Makati, Metro Manila.